HENLEY Dragons suffered mixed fortunes as they and 19 other crews took part in round five of the BDA national league on Caldecotte Lake, Milton Keynes. The strong cross wind made it difficult for the helms to line up their boats on the start line resulting in big time delays which ultimately caused the cancelling of one whole class of racing. The morning session comprised 200m races with crews competing in two heats, their aggregate times deciding which crews raced each other in the final round. 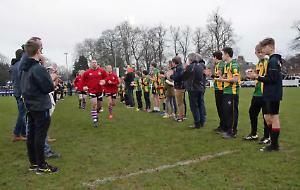 Henley Dragons progressed to the minor final in which they contested and beat Wraysbury and Nottingham. The afternoon comprised a similar format over 500m. In the first of the heats Henley’s guest helm had major problems with the crosswind and on two occasions the crew had to stop the boat as it had left its designated lane. After the second stop Henley just paddled in, believing themselves to be disqualified but the judges decided that no other crew had been infringed and allowed Henley to continue into the second round. For the remaining round and final Henley reverted to their own helm. Henley’s final was for 15th to 17th place where they won by 14 seconds which would have been good enough for sixth overall had they not suffered a problem in the first round.